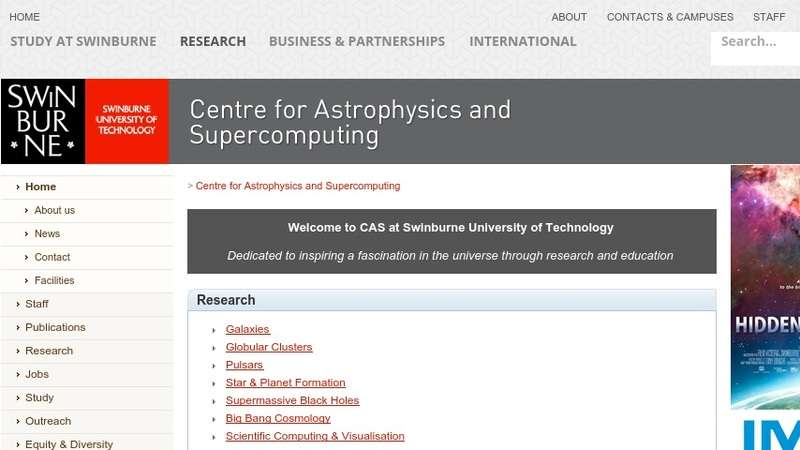 The web page of the Centre for Astrophysics and Supercomputing at Swinburne University of Technology of Melbourne, Australia provides links to news articles and information on research programs and educational programs for university students and the general public. There is also information on the Centre's education and outreach programs, including Swinburne Astronomy Online (SAO), which concentrates on fundamental concepts and key issues in contemporary astronomy for amateur astronomers, educators and communicators, people working in related fields, and the general public. Other materials include Cosmos, an online astronomy encyclopedia for general audiences; information on AstroTours, 3D virtual tours of astronomical objects and phenomena; and information on SpaceWorks, the Centre's commercial arm for combining projection and visualization technology with educational content.